The Chess Trophy is used for the prize and appreciation of the chess tournament. We create two version of trophy which is King Trophy and Queen Trophy. 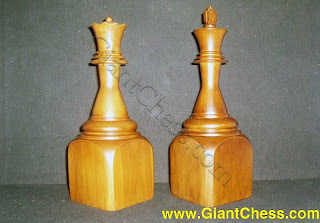 All is made from teak wood and crafted as the regular King and Queen chess. They have beautiful color and shape. Our company provide the 8" and 12" of size for both type, King and Queen. The Chess Trophy is a memorable art piece to posses, to be given, or to collect.